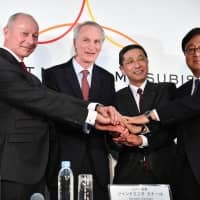 YOKOHAMA - Leaders of the scandal-hit global auto alliance between Nissan Motor Co., Renault SA and Mitsubishi Motors Corp. said Tuesday they will strive for a balanced and stronger partnership to excel against rival carmakers. In an apparent effort to outline the structure of the post-Carlos Ghosn alliance, the three companies said the entity will establish a new joint management board designed to be operated with a fair balance of power. “This is a very special day for the alliance,” Renault Chairman Jean-Dominique Senard said during a news conference at Nissan’s headquarters in Yokohama. The three companies have agreed on several points, including simplifying the alliance management structure by creating the new board. They said it will be the sole governing body of the alliance. Currently, the alliance is managed by a Nissan-Renault venture and a Nissan-Mitsubishi Motors venture. 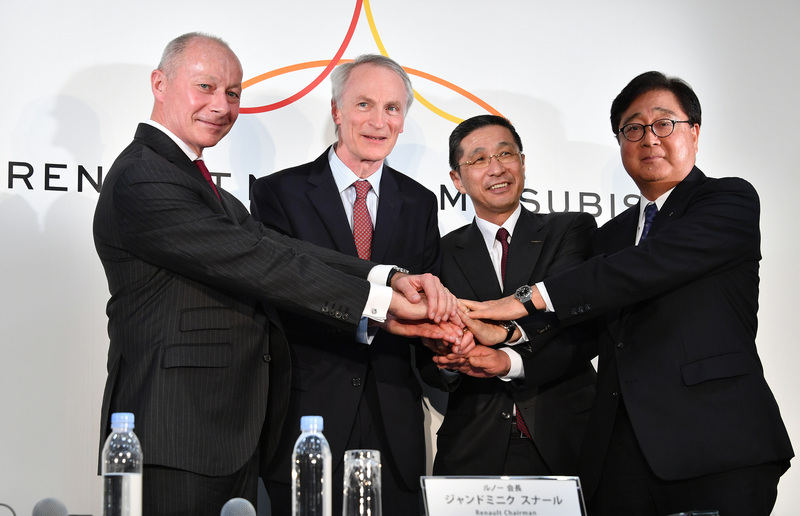 The new board will consist of four members, including Senard, Nissan CEO Hiroto Saikawa, Renault CEO Thierry Bollore and Mitsubishi Motors Chairman Osamu Masuko. All three attended Tuesday’s news conference. Saikawa stressed the importance of respecting fairness, with the previous alliance’s operational structure not having been balanced from Nissan’s standpoint. “Renault, Nissan and Mitsubishi — these three companies — will work under a consensus-based and win-win spirit. This is a real equal-partnership body … this is very efficient and starting something like this has a very significant meaning,” Saikawa said. Previously, the decision-making was up to the head of the Renault-Nissan joint venture board, which was headed by an executive from Renault, meaning Nissan did not have ultimate power to control alliance policies, according to Nissan. But the chairman of the new board won’t have such authority, the firm said. Some Japanese media outlets have also reported that too much power was held by Ghosn, the former Nissan and Renault chief who also doubled as head of the three-way alliance. Saikawa said they agreed that the custom of the Renault chairman assuming the Nissan chairmanship will not apply to Senard, highlighting this change as another example of Nissan’s independence being respected. Nissan and Renault announced that their Amsterdam-based joint venture called Renault-Nissan B.V., which was overseeing the operation of the alliance, will continue to exist and function as a backup alliance operation body for the new board. Renault and Nissan said they are not considering a review of the power balance in the cross-shareholding partnership at this point. Ghosn, who came onboard to save struggling Nissan in 1999, was the architect of the alliance. He had reportedly been eyeing a merger between Nissan and Renault under one holding company while respecting their independence. Nissan was reluctant to accept the merger plan out of concern that its autonomy would be undermined. “I am just taking the situation as it is and looking at the future,” he said. Renault holds 43 percent of Nissan shares while Nissan holds 15 percent of Renault shares. While the fate of the alliance was the focus of attention, reporters also asked a number of questions regarding its former chief. Ghosn, who was released on bail last week from the Tokyo Detention House after more than 100 days, had requested permission from the Tokyo District Court to attend Tuesday’s Nissan board meeting. The court rejected his request, citing the risk of evidence being destroyed if Ghosn communicated with Nissan executives, according to some reports in the Japanese media. Junichiro Hironaka, an attorney on Ghosn’s legal team, said Ghosn is still a board director and so hoped to fulfill his professional duty. Nissan opposed his attendance out of concern that the meeting would not run smoothly, he told reporters in an exchange that was aired on TV. The Nissan board ousted Ghosn from the position of chairman in November after his arrest on Nov. 19, but he remains a board director. To appoint or remove someone from a directorship, the firm needs approval at a shareholders meeting. Nissan plans to hold an extraordinary general shareholders meeting next month to relieve Ghosn and his aide, Greg Kelly, a former Nissan representative director who was also arrested along with Ghosn, of their directorship positions. The 65-year-old Brazilian-born French auto executive’s first arrest in the case, on suspicion of underreporting his income, was made by Tokyo District Public Prosecutor’s Office at Haneda airport. The prosecutors subsequently arrested him again on two additional counts of financial misconduct, including for allegedly understating his income on another occasion and an alleged incident of aggravated breach of trust involving the transfer of private investment losses to Nissan during the global financial crisis in 2008. Ghosn has denied all of the allegations. Senard declined to comment on the allegations against Ghosn, saying that by principle he considers people innocent until a legal verdict is handed down.